Election Coverage: Why the Negativity, NYT? The elections deserve a much longer piece and I will get to that as soon as I get a chance. First impressions: it was not as bad as it could have/would have been. The turn out seemed decent, the number of security incidents not considerable (within the context). As for irregularities, yes as expected. The extent? initial reports do not indicate large scale, systematic fraud. But we can only be certain once the counting unfolds and the observers reports come in. The issue that I briefly want to raise here is the difference in the coverage of the elections in the international media, particularly the US and Europe Media. Giants such as the New York Times approached the elections with a very grim look. Their feature stories, of the election eve as well as election day, were written by Elisabeth Bumiller with Rod Nordland or Alissa Rubin. Both stories began as “Marja, Afghanistan.” It makes one question why the New York times chose to see a nationwide election through such narrow, troubled window? All the articles focused on was the small turnout, the fear of rockets, and the gloominess of the overall picture. The Times’s At-War blog too, ran only entries by Ms. Bumiler from Marja. One can only speculate the reasons for such a narrow-scope of coverage. 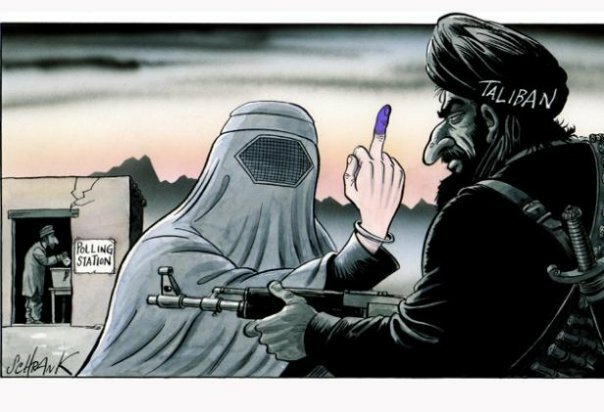 While there is no doubt that the elections faced some of those challenges to an extent, but to boil it down to just that is unfair to the 150,000 international and 300,000 Afghan forces who worked tirelessly to ensure the security of the vote in the face of tremendous threats. It is also not fair to the 4 million who turned up to vote despite having the bitter taste of last year still in their mouth. European outlets were a little milder in their approach, leaving some window of optimism. The BBC, for example, raised as many concerns as the New York Times. 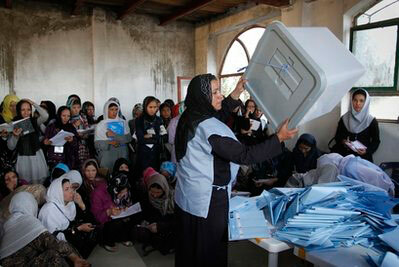 But it was open to the possibility of a decent turn out, and an election with a relatively low degree of fraud. The Guardian too, was harsh. And so it should be. But Jon Boone was kind enough to mention the possibility of success in one his headlines. Just for kicks. Not really sure what the source is. a friend shared it. This entry was posted on Tuesday, September 21st, 2010 at 5:29 am	and tagged with Afghanistan, Elections, Kabul, Karzai, Marja, New York Times and posted in Media, News and Politics. You can follow any responses to this entry through the RSS 2.0 feed. so you think Marja, you know, doesn’t speak for Afghanistan? you must be some kabul cafe or bamiyan prt based dude. get out there. on a less ironic note, i like the post a lot.